SCRAPPING NOMAD: Oh, so happy to have you! 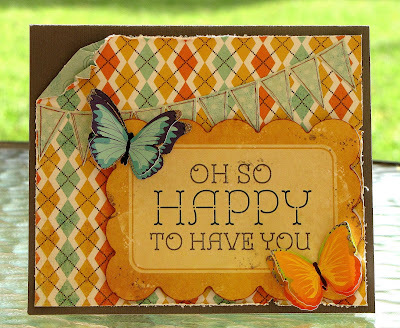 This is a card I created for this week's sketch challenge at Let's Scrap. I started with the sentiment cad and chose the cardstock, papers and embellies to match it. I have already said this, but I LOVE these Martha Stewart butterflies!!!!!!!!!!!!! Loving your new stash Caro. Your card is beautiful. Love the paper!! !